Today we are continuing on with our discussion of A Woman's Wisdom : How the Book of Proverbs Speaks to Everything, by Lydia Browback. 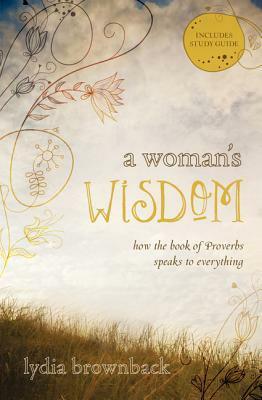 Today I would heartily recommend you start by reading the introduction to Chapter 3 entitled Wise Women Know the Power of Words. I think it is best to hear what Brownbeck had to say first. Our words carry tremendous power, and perhaps that is why Proverbs contains so many sayings about how we use our tongues. We find the same perspective in the New Testament. The apostle James wrote, "The tongue is a fire, a world of unrighteousness. The tongue is set among our members, staining the whole body, setting on fire the entire course of life, and set on fire by hell. For every kind of beast and bird, of reptile and sea creature, can be tamed and has been tamed by mankind, but no human being can tame the tongue. It is a restless evil, full of deadly poison. With it we bless our Lord and Father, and with it we curse people who are made in the likeness of God" (James 3:6-9). So it is clear that we can greatly affect our well-being and that of others by what we do with our tongues. That being said, the power of our words springs not from our actual tongue but from the heart that controls it. Jesus made clear that our words are a reflection of our hearts, which is why they will be judged so strictly: "The good person out of his good treasure brings forth good, and the evil person out of his evil treasure bring forth evil. I tell you, on the day of judgement will give account for every careless word they speak, for by your words you will be justified, and by your words you will be condemned" (Matthew 12:35-37). Bottom line of what I have to say here: we need to shut up a lot more than we do. Harsh? Perhaps. But necessary. More thoughtless words fly out of our mouth than can be considered even close to being proper. Careless words seem to be the norm, rather than the exception and we all love to find reasons and excuses to share our thoughts, opinions and feelings without considering the effects our words will have. Mostly, we deny that words have an effect, so perhaps we should start by proclaiming that truth right off the bat. * Well, I didn't mean to hurt them. * I didn't intend to be unkind. * I think it's kind of silly for them to be upset about something like that. * Well, if they are truly so upset about what I said, they just need to get over it. * I was just being funny! * They take things so seriously. They need to lighten up! * I was trying to be nice. * It's not my fault. But when we speak a careless word it is our fault. The sooner we own it, the sooner that the damage can be repaired and wounds can begin to scab over and heal. Whether or not you confess an intention to hurt someone with your lazy thoughtlessness, you have. That is a truth and now you must consider how to speak accurately and well to reconcile with the wounded. It is your job to make the situation right, no matter how much pain and humility you might feel in the process. Usually (and unfortunately) it is that pain and humility that we feel in trying to apologize that impresses upon us the need to speak more accurately and wisely in the future. Wouldn't it be better if we paid careful heed to our words before speaking in them in the first place? Consider how they might make another feel, from their perspective and in their shoes. No matter how much you just want to "share your opinion", offering a justification for your own actions, deliver "a very sensitive prayer request" or just "vent" - it will always be in your worst interest to spill your thoughts. It is almost always in your best interest to hold your tongue. Sometimes choosing silence can make you feel as if you are about to explode inside - (I know this. Please don't ask me how I know!) - but it will be much better if we carefully think through and plan our words before unleashing a torrent of careless ones. Because, as Brownback pointed out, what comes out of our mouths reveals the heart. We might want to consider what is in there, and deal with that content before the Lord, before we expose it to anyone else. At the very least, our loose tongues can endanger someone else. At the very most they will expose us for being fools. Just like Abi said, I want to read this book more and more each day! It sounds really powerful and much needed(for me). Count me in again... I definitely really want to read this one. OUCH! Yes, learning to be quiet when our human self wishes to retaliate is a hard one. One that I work on every day. And with the help of the Holy Spirit! I am getting better. Thank you for being frank, we need honest teaching, even when it cuts. Great comments about the power of the tongue. Always so convicting. Bored speculation...yep D and I had that conversation recently. I'm guessing I sm not the only one putting this on a wish list if I don't win. Sounds incredible. Q : would it be recommended for a Christian who rarely reads? Looks like a great book. Would love to win a copy! Excellent reminder about the strength of thoughtless words! This sounds like a much needed book. Thanks again to you & the publisher for the giveaway opportunity. I think that often when we think of sins of the mouth, we think of gossip or harshness. But thoughtlessness is just as bad. That verse about being accountable for every idle word is very scary. Yep. I need this one. I'm definitely one of the male sorts who needs to watch his words. "Because, as Brownback pointed out, what comes out of our mouths reveals the heart. We might want to consider what is in there, and deal with that content before the Lord, before we expose it to anyone else." Yee-owch. I am generally prone to say things like "Lord, I thank you that I am not like those people over there who like to gossip and who are always judging everyone else. I thank you that I have wise things to say instead of all that foolishness that comes out of their mouths..."
This is a convicting series, sister.